Celebrating Melbourne's amazing pastry scene, Sweet Set is a curated selection of pastry chefs and bakers presenting sweet treats complimented by Grub's savoury offerings. 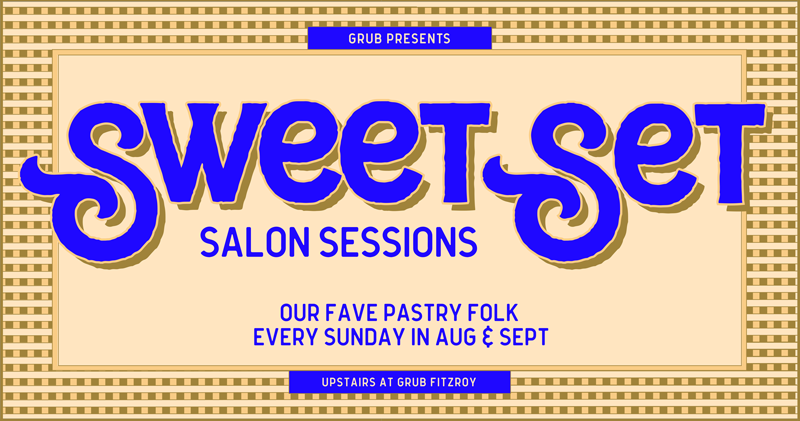 Gather your mates for an indulgent sweet session in Grub's posh salon. *For Sunday Sept 2nd let us know how many little adults, under 12 could be joining the group. Please tick to agree to the following terms. I understand that due to the nature of the menu we are unable to meet specific dietary needs. As Sweet Set is a ticketed event; tickets are non-refundable, however, you are welcome to transfer them to a friend or alternate party.